A domestic mechanism alone to deal with accountability for human rights in Sri Lanka is not likely to be sufficient, a senior US Senator said on Tuesday. Senior US Senator Patrick Leahy told the Senate on Tuesday that it was essential that the justice process was not only about truth telling, but was also a “credible, independent mechanism with authority to investigate, prosecute and appropriately punish those responsible for war crimes”. Leahy who is a ranking member of the Senate Judiciary Committee, said that for years impunity for serious crimes has been the norm in Sri Lanka. “The Sri Lankan people, the United States and other governments, the United Nations, and international human rights groups have long called for justice for the victims of atrocities committed by the armed forces and the LTTE during the 30-year conflict,” Leahy said. He urged Sri Lankan officials to consult with victim families, local civil society organizations to develop a credible and successful accountability mechanism. The senior US lawmaker hailed what he called ‘encouraging steps’ taken by the new Government of President Maithripala Sirisena to promote good governance, human rights and reconciliation since his election on 8 January. “Among the Government’s initial accomplishments are the adoption of the 19th Amendment to the Constitution,” he noted. 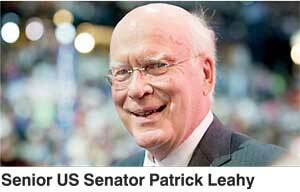 Leahy said he was also encouraged that the government has revived its relationship with the United Nations, including with the UN Human Rights Council, and has invited the UN High Commissioner for Human Rights to visit Sri Lanka.